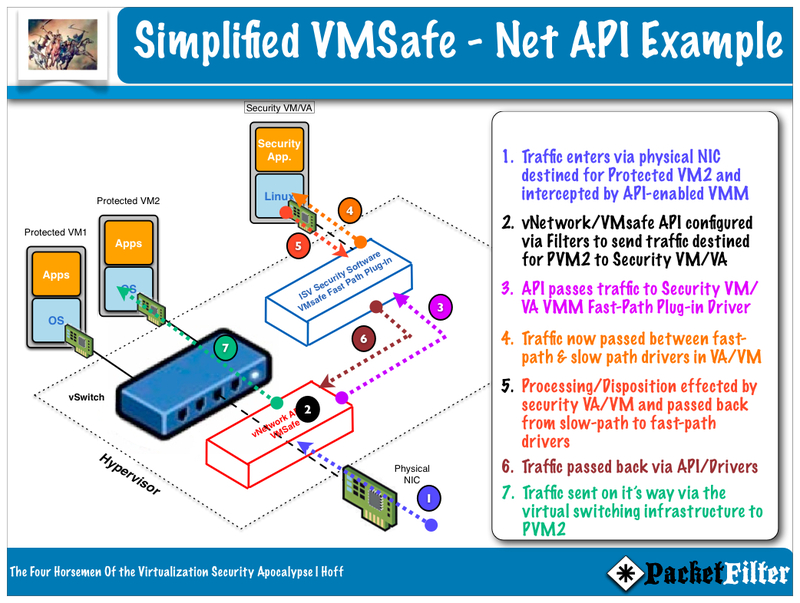 We chose not to deploy a virtual FW solution for intra VM traffic because none of the solutions listed provided detailed enough logs for administrative activities or had adequate governance/segregation of duties. (1) For the above reasons – logging & change management of administrative activities; separation of duties. (2) We have 10G physical firewalls and simply do not need the potential performance benefit of other solutions. If we saved a millisecond the users will not notice. Using virtual technology as an enhancement, not replacement for physical firewalls is a possibility though (micro-perimeter), but we’d still have to figure out how to separate administrative duties, and we’d still end up with multiple overlapping systems for policy enforcement and the overhead that entails. 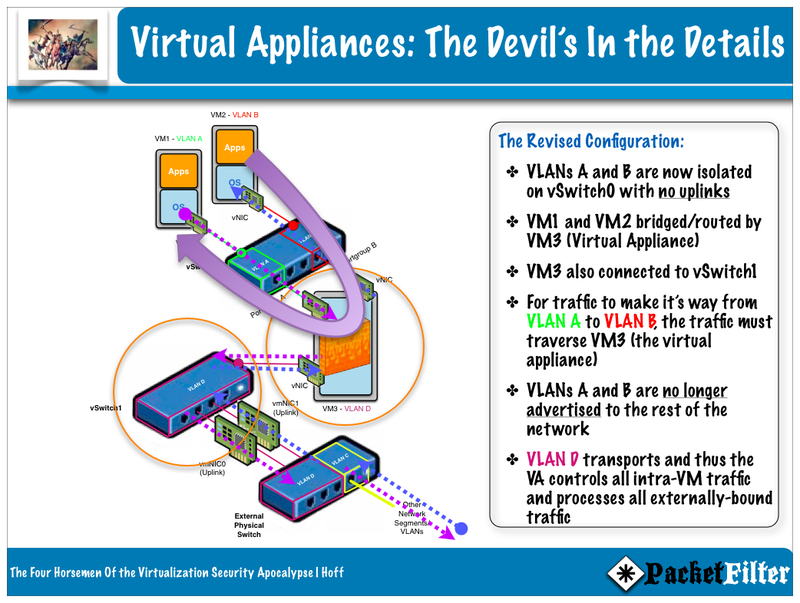 A few vendors, such as my employer (Vyatta), are focusing almost exclusively on providing layer 3 services (firewall, advanced routing, NAT, VPN, DHCP . . .) within the hypervisor. While many of our engagements are test and dev. deployments, we are starting to see far more sophisticated, on demand data center instances being offered by cloud service providers. 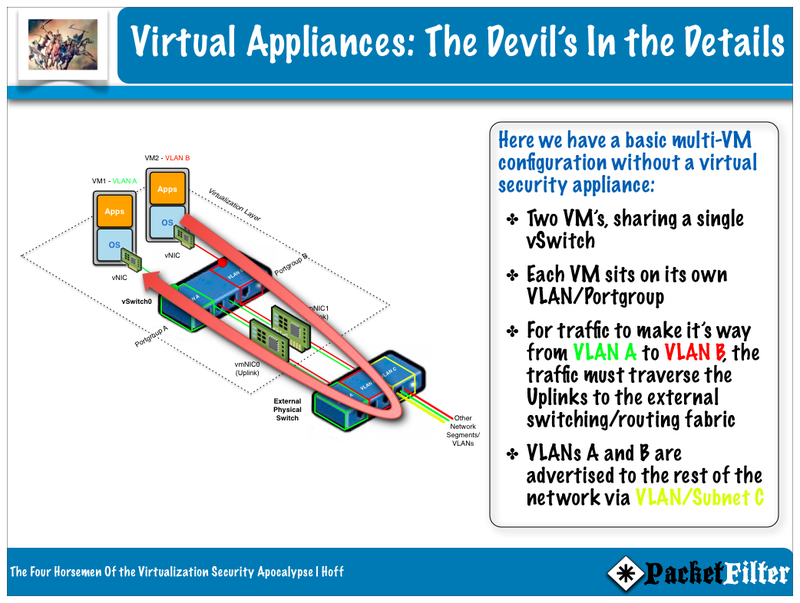 The advantage isn’t from saving a few milliseconds by not hair-pinning traffic through a physical router, no, the gain comes from the agility to be able to deploy a new firewall/VPN on demand without relying on buying/installing/cabling new hardware. With utility pricing, it means there is no capex until you have a customer who needs the service. Could someone tell me what is the “layer 3” solution from Juniper ? I’v found vShield Edge and Cisco Asa 1000v Cloud Firewall but not the one from Juniper! Juniper offers the virtual version of the SRX called JunosV Firefly. It’s currently targeted for specific use cases in complement to vGW. Thanks for your quick answer! I saw Firefly is actually in Beta! !